Leave a comment (no rules) and be eligible for one 3-pack of God of Fire Serie B (robusto gordo). Deadline – 11:59pm EST on 12DEC. Random selection and announcement will take place on 13DEC. Perfect Holiday Gift !!! 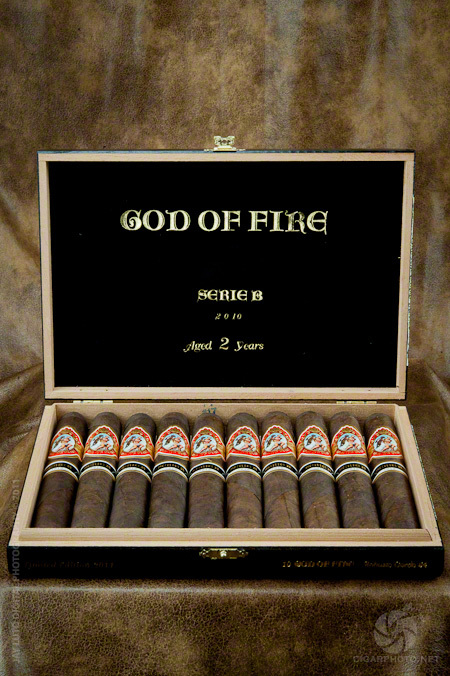 This week we are photographing and reviewing a God of Fire Serie B (robusto gordo 54), a product released through collaborative effort between Keith K. Park of Prometheus and Carlos Fuente Jr. Serie B will be available this holiday season in two vitolas: robusto gordo (54×5.5″ – $22 msrp) and gran toro (56×6″ – $24 msrp). Release quantity – 10,000 each. 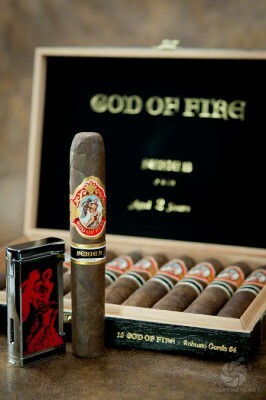 God Of Fire Serie B line, produced in Dominican Republic at Tabacalera A.Fuente y Cia, will come in two different blends. Similarly to the God of Fire by Carlito 2007 review, the overall presentation of God of Fire Serie B ‘robusto gordo 54’ was near perfection. That goes for the box design, packaging and band story. 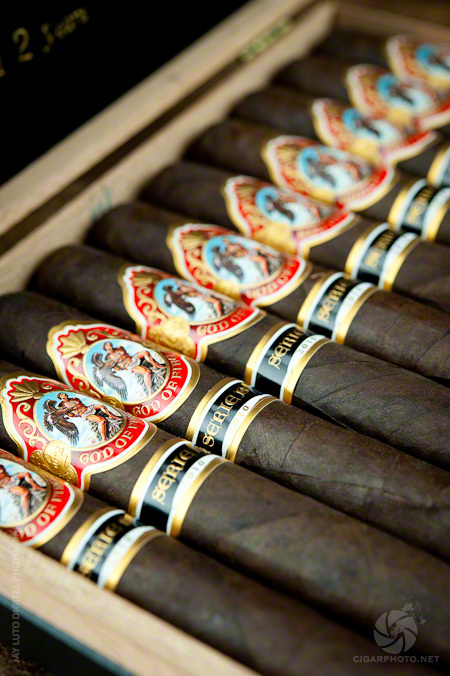 There is a bit of a departure when it comes to cigar’s construction though. If I was to compare visual presentation and construction of the GOF Serie B (robusto gordo 54) to the GOF by Carlito 2007, I would identify the former as “bold / edgy” and the latter as “refined / smooth.” GOF Serie B ‘robusto gordo 54’, as stated above, was sporting a thick, rugged looking, Ecuadorian Sun Grown wrapper with plenty of thick veins and clearly visible seams. After clipping it, easily detectable peppery spice on a cold and free flowing draw. 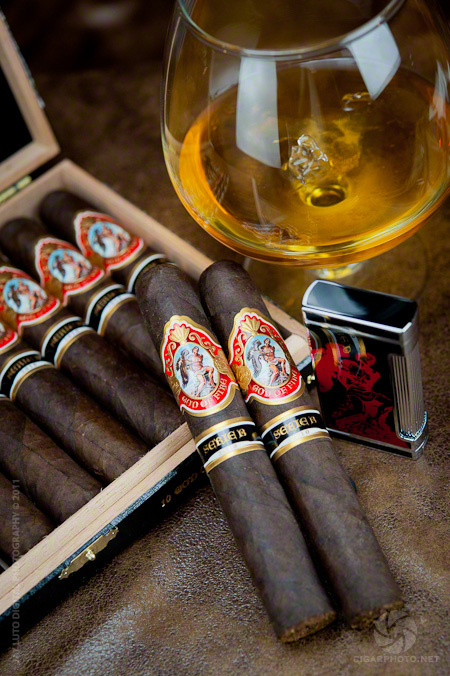 In flavor department, I was able to extract the following: earthiness, woodiness, black pepper and hints of sweetness on the tip of the tongue and lips. The Ecuadorian Sun Grown wrapper triggered sharp increase in the strength department. Retrohale was an experience in itself. Ash, although not as good as GOF by Carlito 2007, was still holding-on fairly long and needed couple extra taps to fall off. Burn line from the beginning to the end was a bit wavy on the first smoked sample but perfect on the second. This was surely an interesting and a bit unexpected experience. 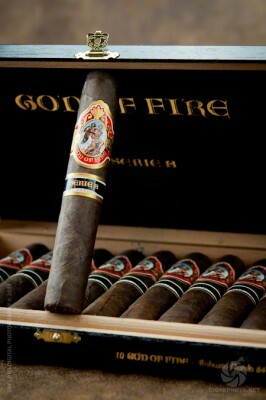 I always thought of God of Fire cigars as smooth, refined, etc. 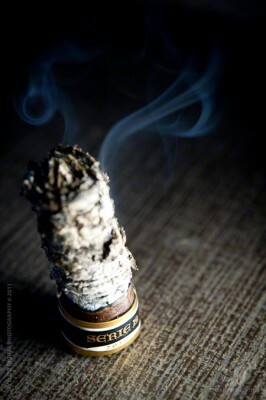 That was not the case with GOF Serie B ‘robusto gordo 54.’ The latest project is edgy, bold with “dark / deep” flavors. If you are a God of Fire follower and always wanted a similar experience with an extra kick, don’t look any further. Having said that, what also comes along with Serie B is a familiar price tag ($22 / $24 depending on vitola). 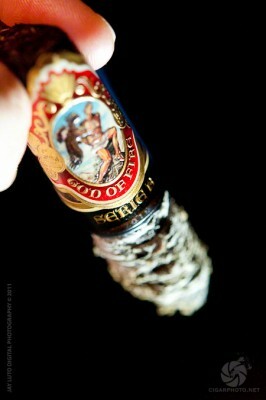 I was very pleased with GOF by Carlito 2007 and its price tag didn’t scare me away. 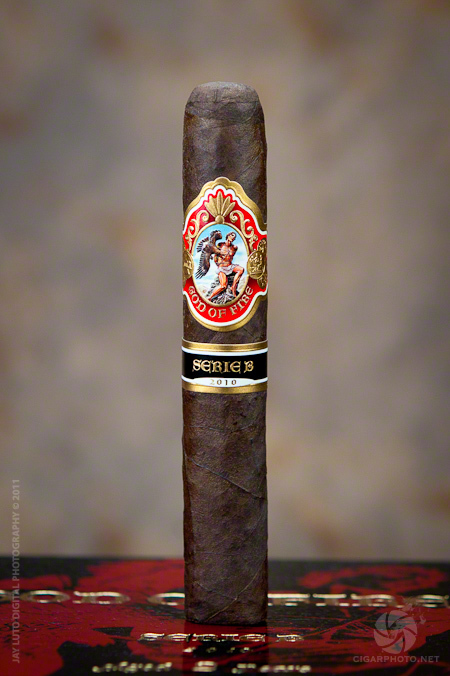 I don’t think I feel the same about Serie B ‘robusto gordo 54.’ Your mileage may vary ! Perhaps for me, it was the Ecuadorian Sun Grown finish that put a spin on the experience. 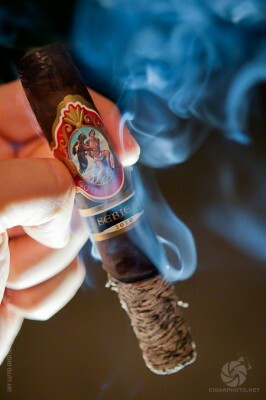 I understand that my fellow photographer / blogger (Brooks from smokingstogie.com) enjoyed his ‘Gran Toro’ with Connecticut Broadleaf Maduro wrapper quite a bit. I have a soft spot for Connecticut Broadleaf so for now, I’m looking forward to trying the Gran Toro ! * DISCLAIMER: God of Fire Serie B cigars were gifted by Keith K. Park of Prometheus. Keith’s generosity had no impact on the actual experience. 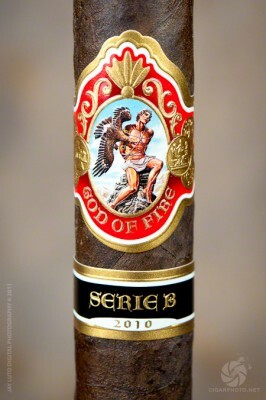 You are currently browsing the archives for the God of Fire Serie B category.